Seven diagrams from movement investigator and trainer Irene Dowd’s 1984 essay, On Metaphor, collected in Taking Root to Fly. “Studying the history of the eye’s growth… through the depiction… of the developmental process in five arbitrarily determined stages… enabled me to develop a metaphoric model of the activity of ‘seeing’. In each developmental stage, except for the very first one, there is simultaneously both movement outward from the neural core toward the surface periphery of the body and movement inward from the outside toward the neural core. The stages successively provide a more and more complex and elaborate map of precisely how these oppositional streams of moving cells and light waves can travel, grow, and interrelate” (p74). Each of the five figures below depicts the developmental model on the left and Dowd’s metaphorical model on the right. Stage 1, 28-day-old embryo: The optic vesicles protrude from the head end of the neural tube toward the surface ectoderm (primitive skin, the interface between the inside and outside world of the embryo) (p72). Stage 2, 30-day-old-embryo: As the optic vesicles or bulbs continue to grow outward from the neural core, they become concave, cupping as if to receive the outside world they approach (these optic cups are the primitive retina, ground for the light sensitive rods and cones). 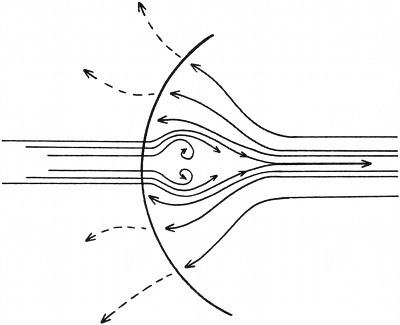 Stimulated by the approach of the optic cups, surface ectoderm begins to thicken and invaginate into the cups (p72). Stage 3, 33-day-old embryo: The optic cups continue to enlarge, encircling and grasping the thickened surface ectoderm. As if the optic cups were inhaling it, the surface ectoderm continues to grow into the cups until it has itself inhaled, encircled tiny globes of the outside world (these globes are the primitive lens, which will be able to change shape to accommodate vision from things far to things near in the outside world, just as if still remembering that outer place) (p73). Stage 4, 42-day-old embryo: Immediately filaments grow to join each optic cup (continuous with the neural core) with each lens vesicle (bubble of outside other). These filaments provide a rudimentary blood supply called the hyaloid artery which nurtures the rapidly differentiating and growing primitive eye (this is gradually replaced by the circulatory system that is fully mature at eight months) (p73). Stage 5, 100-day-old embryo: Once the hyaloid artery has firmly tied each lens vesicle to its optic cup, the cup releases its suction-like hold on the lens. As the lens floats free, its cells and those of the surface of the skin it moves toward become transparent like windows to the outside, to light. At the same time, nerve cell fibers are growing from the base of the optic cup back through the optic stalk to the developing brain (eventually over one million nerve fibers are formed that pass from eye to brain, making the optic stalk into the optic nerve whose transmissions are finally made vision within the brain itself). All the cells in the eye continue to mature until they are capable of responding in concert to light to create the complex of stimuli the optic nerve feeds back to the brain to produce vision (p73). “If all the stages are put together in a single composite picture, they form a complex but consistent pattern of fluid dynamics. As the core moves outward toward surface, it also expands to cover a broader area. Seeping out past the surface membrane, it dissipates even more widely into space. As the outside moves inward through the surface membrane, it coalesces as if compacting the whole of the boundless outside into a tiny enclosed globe. Concentrating even more, it continues to stream into and through the center of the central core itself” (p74). A composite metaphorical model for the dynamics of ‘seeing’ (p74). “With abstraction, this model of a developing and ‘seeing’ eye can be used as a metaphor for a way in which any cell, cellular organism, or organism segment with a self-enclosed membrane or skin might interact with its environment or world outside it” (p74). 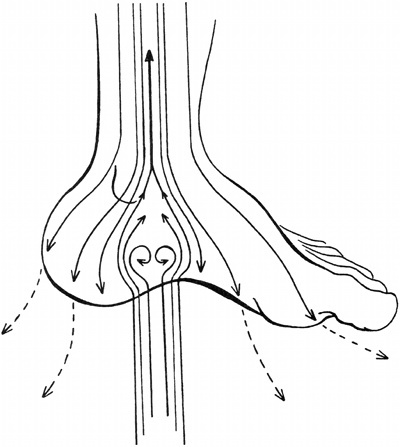 “This fluid-dynamics metaphor that describes ‘seeing’ serves equally well as a model for the pathways of connection between feet and ground in such activities as standing and walking. The sole of each foot functions like a retina that grows developmentally outward from the pelvis, central core structure of the body, down through the leg to spread the bottom surface of the foot in an ever-widening base of support that is ‘looking’ down and out into the ground. The ground itself is visualized as a transparent cornea through which light passes from the living earth beneath. The light enters the foot which receives the light in the curved space beneath its central dome. The light continues to travel up through the dome and into the central axis of the leg, thrusting the bones—like light beams—straight up into the pelvis they support. “…I verbally suggest to students that they might visualize their feet (or any other parts of themselves) as if these were eyes ‘seeing’ in the way I have just described…” (p75). Metaphoric ‘seeing’ with the foot (p75). “Metaphor can be the fist that breaks through the dark glass between what is already known and what is still mystery. “Through the vehicle of metaphor, we can participate in that movement from what is to what can be. “Once in the new land on the other side of the dark glass, we can use the metaphor as a landmark from which to foray into the new world. “Eventually the metaphor dissipates in explosion outward from its core into the space of new landscape. Finally another metaphor coils around the landscape, coalescing into a new vehicle in which we continue the journey” (p69).